We are quickly approaching the time of year when we aerially seed cover crops into standing corn and soybeans. Earlier seeding allows for more growth and consequently more biomass to protect soils from erosion. It also allows the opportunity to extend fall grazing. One benefit of cover crops in a dry year, if we can get them to grow, is to scavenge nutrients that were not used by row crop production due to abnormally dry soils. However, with our extended dry period and not many good chances for rain in the forecast, concerns have arisen about seeding cover crops in dry conditions. Suggestions below are offered to help minimize risk for seeding in dry conditions and address potential herbicide carryover impact on establishment of cover crops. Delay aerial seeding until the forecast for precipitation improves. Switch from aerial seeding to post-harvest seeding, with hopes for improved chances of precipitation. As more time passes with delayed seeding, consider switching to cereal rye to get value from the over-wintering cover crop versus one that is winter-killed. 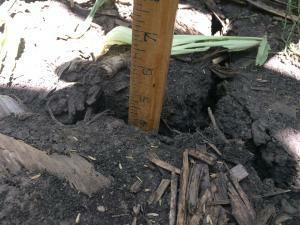 Consider a light tillage pass to get better seed to soil contact with post-harvest broadcast seeding of cover crops. This practice is against the grain of eliminating tillage passes to increase soil health, but may be better for germination success. What about all those cracks in the soil? With some liberty in assumptions, if we state the assumption that seed is evenly distributed across the 30-inch row, then we lose 1/15 of our seed with a 2 inch crack. Below are pictures taken in northern Story County on August 9, 2017. 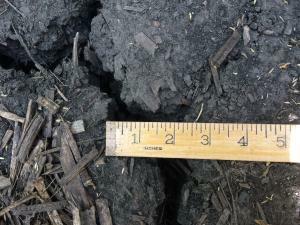 The photos shows a 2-2.5 inch wide crack in the soil, that was 4 inches deep. If we seed now, with a crack like that on a 30-inch row, seed is likely to fall in the crack and be lost from the purpose of growing the cover crop. Even if we get rain, the crack may swell shut, but the seed is unlikely to germinate from such a depth. Herbicide carryover is an important consideration following a dry summer, especially if applications of residual herbicides were made without significant rainfall afterward. There is also very little information available that specifically relates risk of cover crop failure to herbicide use in dry conditions, but we do have some information about the relative sensitivities of different cover crops to herbicides. Generally speaking, radish is considered to be one of the most sensitive species to herbicides and cereal rye is considered to be one of the most tolerant across situations. Knowing this information, we can begin to assess the risk of seeding different species. Other research is also available to look at some of the relative sensitivities of different species to different products. Dr. Kevin Bradley, weed scientist with the University of Missouri, did three seasons of cover crop establishment work and has it posted online on his website. They applied full rates of herbicides in late June or early July and drilled cover crops into plots in early or mid-September. The researchers noted that more significant issues were documented in years with less rainfall. When looking at the University of Missouri research, err on the cautious side as this year is more likely to be one that would cause injury. For those who had little rainfall after all herbicide applications this spring and summer, species choice may be limited. The herbicide bioassay is a simple and inexpensive method to help determine whether the herbicides in your field will be likely to cause a cover crop failure. However, if this cover crop is planned for use as a feed source for livestock, herbicide label crop rotation intervals and grazing restrictions must be taken into consideration as well.